No Chief Justice of a High Court remained as much in the headlines as the Chief Justice of the Punjab and Haryana High Court, Justice Binod Kumar Roy. It is not known whether he enjoyed or detested those headlines, but he said goodbye to Chandigarh yesterday perhaps not knowing how deeply wounded an institution like the Punjab and Haryana High Court he has left behind. The crudeness of the kidnapping and subsequent murder of Hoshiarpur schoolboy Abhi Verma is hard to believe. The despicable act has raised a couple of questions: was it avoidable? Could the precious life be saved had the police been a little more vigilant? External Affairs Minister K. Natwar Singh’s brief visit to Afghanistan will go a long way towards rebuilding India’s traditional relations with the war-torn country. THE tiger in India has been on the death row since the early nineties. After a tremendous pressure from NGOs, both national and international, there was acknowledgement that the tiger was facing a second crisis — the first being in the late sixties and the early seventies when Project Tiger was launched. Unlike the rustic politician from Jatland, the Goan lawmaker affects sophistication. His immaculate wardrobe goes nicely with his painstakingly acquired English pronunciation. He returns home from foreign trips with photographs of himself at seminars, conferences and other intellectual endeavours. As a natural corollary, expensive antiques adorn his tastefully decorated home. Or is it a case of empty political posturing? After seven years, huge international debate and the freezing out of George Bush’s United States from the international community, the Kyoto Protocol was formally ratified on Wednesday. RAWALPINDI: President Gen Pervez Musharraf and Prime Minister Shaukat Aziz on Tuesday approved an action plan to meet growing energy requirements in immediate, medium-term and long-term perspectives. No Chief Justice of a High Court remained as much in the headlines as the Chief Justice of the Punjab and Haryana High Court, Justice Binod Kumar Roy. It is not known whether he enjoyed or detested those headlines, but he said goodbye to Chandigarh yesterday perhaps not knowing how deeply wounded an institution like the Punjab and Haryana High Court he has left behind. It is a small matter that only one of his colleagues turned up for his farewell party hosted by the bar, or he declined the invitation to the customary dinner the judges host for a departing Chief Justice. But it is unfortunate that the High Court remained caught in a crisis during most of his over two-year stay at Chandigarh and it could be resolved only by the Supreme Court collegium choosing to recommend Justice Roy’s transfer to Guwahati. Justice Roy never questioned his belief that he is always right and as such would never come to know what really went wrong with the High Court during his tenure. He also might not have pondered how the Punjab and Haryana High Court, which used to enjoy great prestige, became a subject of daily gossip at the bar, in the media, as well as in the market square during the two years he spent at Chandigarh. One cause of the loss of prestige of the Punjab and Haryana High Court was the adversarial relationship that evolved between the Chief Justice and a majority of the judges. Factionalism became the order of the day; the High Court got divided into various camps; and most of the judges one day took the unprecedented — and certainly ill-advised — step of going on mass casual leave. The judges’ step came handy to the Chief Justice, but he never took any step to look into the reasons that led them to abstain from work. Not all the judges can claim to live up to the high standards expected of them, but Justice Roy had the tendency to paint everyone with the same brush. He simply could not distinguish between the sinner and the one who did no judicial wrong, with the result that even those who tried to walk on the righteous path got alienated from the Chief Justice. Justice Roy was said to be keen on fighting corruption, but he spent most of his time and energy fighting his brother judges. At the end of the day, the loser was the Punjab and Haryana High Court, which suffered the loss of esteem in public eye. It will take time and much effort on its part to retrieve it now. The crudeness of the kidnapping and subsequent murder of Hoshiarpur schoolboy Abhi Verma is hard to believe. The despicable act has raised a couple of questions: was it avoidable? Could the precious life be saved had the police been a little more vigilant? Abhi was kidnapped in broad daylight despite the police being deployed in strength on account of Valentine’s Day. A red alert was sounded after the incident and yet the kidnappers could take the unconscious boy out of the town in a car to dump him in the fields. The horror perpetrated at Hoshiarpur has left parents worried about the safety of their children. Is the state administration prepared to deal with the sudden, and rather intriguing, spurt in the incidents of kidnapping in Punjab? It was the kidnapping of an Amritsar school student, Prabir, on February 7 that started the latest chain of incidents. School students came out in the streets in Amritsar and appealed to the Prime Minister and the Chief Minister to intervene, but to no avail. Their appeals to the kidnappers too have gone unheeded. Obviously, a gang of hardened criminals is involved. Similar incidents have been reported from Jalandhar and Kapurthala. The media too is splashing the crime news, highlighting the growing sense of insecurity in society. The new DGP, Mr S.S. Virk, says Punjab, on an average, witnesses 500 kidnappings annually. Most are cases of voluntary disappearance. While Punjab is nowhere near Bihar if the crime figures are compared, some common factors — the lust for easy money by picking on soft targets like children, widening economic disparities, the craze for a glittering lifestyle, the growing unemployment and drug addiction—are at play in both states as also elsewhere in the country. Meanwhile, the political temperature in Punjab is rising due to the coming Ajnala byelection. Kidnappings arouse strong passions among the people, but politicians would be ill-advised to make political capital out of the tragedy Abhi Verma and other children have met in Punjab and elsewhere. External Affairs Minister K. Natwar Singh’s brief visit to Afghanistan will go a long way towards rebuilding India’s traditional relations with the war-torn country. Post-Taliban Afghanistan has been looking towards India not only for infrastructure development but also for the training of its doctors, teachers, police personnel, administrators, et al. The one reason is that the Afghans feel more at home in India than in any other country because of historical reasons. The damage caused to the India-Afghanistan relations during the Taliban regime has been repaired, and efforts are on to restore the old ties. India has already committed $ 400 million for the 2002-2008 period. When President Hamid Karzai comes to New Delhi next week, he may ask for more because the feeling in Kabul is that India, being a developing country and a traditional friend, understands the requirements of Afghanistan better than the other donors, most of whom are developed nations. Though Indian assistance to Afghanistan covers almost every area of activity, New Delhi must be prepared to take it to greater heights. As is well known, Afghanistan is a gateway to the Central Asian republics where India has a lot to do in the years to come. Indo-Afghan relations got a boost last year after Prime Minister Manmohan Singh’s meeting with President Karzai on the sidelines of the UN General Assembly session. India has been making strenuous efforts for getting transit rights for its goods through the traditional Silk Route passing through Pakistan, but Islamabad’s response has not been positive so far. India’s demand has a humanitarian aspect to it because the grant of the right of passage through Pakistani territory will ultimately help the Afghans, who are in need of all kinds of help from any source. One hopes Pakistan will have second thoughts on the subject. Who is it who can tell me who I am? THE tiger in India has been on the death row since the early nineties. After a tremendous pressure from NGOs, both national and international, there was acknowledgement that the tiger was facing a second crisis — the first being in the late sixties and the early seventies when Project Tiger was launched. After tremendous rallying around by tiger lovers, Project Tiger officials, NGOs and international donors, there was reprieve for the tiger but, alas, it seems to have been a short one. Now a doomsday scenario is being enacted in Rajasthan, for the tiger has disappeared from most of its habitat in the state. According to Tiger Watch, except for Ranthambhore National Park, where the number of tigers has come down from the official 45 to about 20, there are no tigers in the Sariska Tiger Reserve, or in the Ramgarh Bisdhari sactuary (14 in 1982), in Darrah, Vanbihar Ramgarh and Sitamata sanctuaries. In the last three sanctuaries tigers were last seen in 1993. In Sariska, not even the pug marks, a tiger kill or even the tiger scratchings on a tree have been sighted since the monsoon last year. The last tiger seen in the park was in June 2004. The fact that several leopards are being seen in Sariska is another indication that the tiger has either moved out or disappeared from the reserve. In fact, tigers seem to have vanished from five of the 27 tiger reserves in India — Sariska, Palamau (Jharkhand), Namdapha, Dampa (North East) and Indravati (Maharashtra). Not even pug marks have been sighted in these tiger reserves, lamented Mr Valmik Thapar, now a member of the Central Empowered Committee for forests and wildlife, appointed by the Supreme Court of India. In fact, some angry and unhappy tiger lovers have even suggested that Sariska should be delisted and the money allotted for it better utilised in parks where there is still scope to save the big cat. The Ministry of Environment and Forests has lost the clout it had when Mr Kamal Nath. Mrs Menaka Gandhi and Mr Rajesh Pilot headed it. Even the bureaucrats in the ministry seem to be lacking the kind of commitment earlier seen in the ministry. How else can one explain the fact that the Steering Committee of Project Tiger has not met in the last two or three years. Even the Indian Board for Wild Life has not met for 17 months. There is total absence of the political will for environmental issues in the country. There is no sign of a Green Party. In Indira Gandhi and Rajiv Gandhi, the country had Prime Ministers who were concerned and committed to environmental issues. Now that the Congress is back in power, can one hope for the reversal of the tremendous setback that environment has suffered even if we cannot have a Green Party? Will there be the strong commitment needed to protect out coastlines and wild life in the sea and forests? Will there be an earnest effort to stop the decimation of our green cover and mining in forest areas and tiger reserves? As Mr Ranjit Sinh, a former Additional Secretary in the Environment and Forest Ministry and the author of the Wild Life Act, pointed out, some national parks and tiger reserves have become “isolated zoos” because people go there on a picnic to see a tiger. Tiger tourism is ruining Ranthambhore National Park. A common sight is the tiger encircled by jeeps with 30 to 40 cameras trained on it. Quite obviously, the animal is uncomfortable and does not know where to run. Many of the vehicles being used are of diesel though they are not supposed to be used because of the noise and diesel pollution they cause. This is hardly the atmosphere conducive for the breeding of tigers. The people per se have failed the tiger. We have not been able to create public opinion in its favour. Even the eco-development schemes around the park, for which the World Bank and other big donors have pumped in Millions of dollars, have failed! The purpose of eco-development was to encourage the development of fuel, fodder and other necessities of people in the villages outside the park so that they do not scavenge in the protected area. Some of the money seems to have been spent on constructing a wall around most of the park. This wall has breached at several places so that villagers can walk in to collect firewood and graze cattle inside the park. The money would have been better spent in the advocacy of wild life with the villagers. RNP has some 400 km of road inside the park but unnecessary roads are still being constructed in the breeding valley of the tigers — Chandhali. Hundreds of green dhonk trees have been cut during construction. There is uncontrolled movement of pilgrims to the Ganesh temple and on festive days it can go up to 10,000 pilgrims. After the mela they cook and use gas cylinders. This is really dangerous for legally not even a match stick should be allowed inside a park. There is even poaching inside the park. Recently a dead jungle cat and some foot traps were seized 50 metres from the main forest office. According to Tiger Watch, bush meat is being sold openly, at prices cheaper than mutton, at Khandar, Kundera, Sanwata and Rajbag chowki areas. Each village has appointed a tribal shooter (Moghiya) for protecting their crops from the herbivores of the park. Villagers and the Moghiyas benefit mutually. The Moghiyas protect the villagers’ crops and they in turn protect the Moghiyas. At Uliana village, sambar and wild boar meat is available at Rs 40 and Rs 30 a kg respectively. Though no activity is allowed inside a national park, fishing takes place regularly at Mansarovar and Amli dah jeels. There is obviously a systemic failure that tigers should be disappearing in this manner. There is no proper management of the parks — be it Ranthambhore, Sariska or the parks outside Rajasthan. Earlier, when there were committed people at the ministry, park managers were chosen with great care. They were the brightest of forest officers with a deep understanding of wild-life needs and management. Now the system is top heavy. Since 1987 no subordinate forest official has been appointed. The result is that there are just a third of the forest guards needed to protect the park. Mr P K Sen, former Director of Project Tiger, now with WWF-India, says 4000 vacancies of forest guards have not been filled. In Bandhavgarh, Madhya Pradesh, six directors have been changed in four years. Some continuity of tenure is needed for directors to protect the parks. The other big problem is that the funds from the Centre reach the parks only in January/February when the financial year is almost coming to an end. With mammoth efforts by all concerned, the tiger may still be saved. Once the tiger disappears, the forests will disappear. No amount of money can bring back the tiger to the area from where it has been wiped out. Is someone listening? Scratch the differences on the surface and it is evident that the average Goan MLA does share the native cunning of his cow-belt counterpart. And what is more, he is more than willing to use it to unearth cavernous loopholes in the Indian Constitution. Iron-clad rules elsewhere have turned into soft putty in the practiced hands of the Goan politician as he tests the limits of law. It took none other than a first-time MLA with little formal education to show that the Indian Constitution made profitable bedtime reading. A little more than three months after his election Churchill Alemao brought down veteran Chief Minister Pratapsingh Rane’s government sparking off tremors in the state politics that is felt to this day. Lore has it that Alemao, who owns the Churchill Brothers Football Club, merely wanted to be Sports Minister. Having been snubbed royally by Rane, the six-footer decided to take the top job himself. Less than three weeks later Alemao was dethroned. The man who rose to power was none other than Speaker Dr Luis Proto Barboza himself. His marathon surgical sessions saw defectors from different political outfits prop him to the top job. The eight months he enjoyed as Chief Minister till the courts removed him, left Barboza satisfied enough to let him retire from public life. The thrill of Goa’s constitutional carnival did not even spare outsiders. Sent here as Governor, Bhanu Prakash Singh read up the rule books and sacked Dr Wilfred de Souza as Chief Minister by “withdrawing his pleasure”. The apex court then intervened and defined the limits of a Governor’s pleasure thereby setting new standards of constitutional propriety. Subsequent years have seen Goa’s politicians define the laws to suit their requirements. Just when everyone thought that the anti-defection laws would put a stop to horse-trading and toppling of governments, politicians in Goa came up with a neat loophole. They simply got MLAs to resign their seats and thereby weaken their parent parties. The latest victim of creative interpretation of the new rule is Manohar Parrikar whose two-and-half-year old government came to an end when four of his ministers shipped out. It seemed only poetic justice since Parrikar himself got one Congress MLA to quit his seat and contest afresh on a BJP ticket. After winning the guy simply got three others to join him in dumping Parrikar and his BJP. Little wonder that Goa has one Chief Minister and five former Chief Ministers in public life despite having just 40 seats in the single-tier assembly. And with 15 CMs in 15 years it is clear that everyone will be served at the high table! The agreement, which seeks to limit the world’s carbon emissions, was signed by 84 countries in Japan’s former capital city in 1997. It bound the industrialised countries to cut emissions by 5 per cent from their 1990 level by 2012. The treaty has been hailed as the key step forward in confronting the environmental challenges posed by climate change. But it remains controversial: is it a great leap forward in international co-operation or another example of empty political posturing? Or maybe, just maybe, something of both? The case for cutting the global output of greenhouse gases is the link between such emissions and global warming - a link still unproven but for which there is strong circumstantial evidence. This is accepted by most industrialised nations. But for the agreement to become international law two things had to happen. One was that 55 countries had to get it approved by their national legislatures. The other was that the countries approving it had include a sufficient number of industrial countries to account for 55 per cent of their global emissions in 1990. The first target was relatively easily met, but the “early signers” were largely small countries that did not use a lot of energy. The second was tougher, particularly since in March 2001, the new US President, George Bush, said his country was not prepared to ratify the treaty. The US unsurprisingly is the world’s largest user of energy (and hence accounts for 36 per cent of carbon emissions of the industrial countries) so the second hurdle became harder to surmount. But last November Russia, which had previously indicated it would not sign up, switched sides. For many people this is a time for rejoicing, an example of international co-operation for a common good. Like the Montreal Protocol of 1987, which banned the production of CFCs, it has demonstrated that countries were prepared to implement policies that might act against their short-term national self-interest in order to promote long-term global environmental aims. 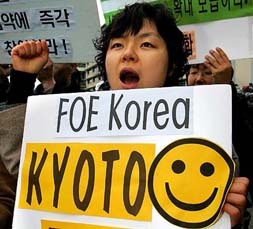 Countries that have refused to ratify Kyoto, most notably the US and Australia, are duly pilloried. President Bush has been particularly singled out as a bad global citizen. For others, this has been an exercise that at best is wishful thinking and at worst hypocrisy. Unlike the Montreal Protocol, which had a clear objective and clear benefits - reducing the damage to the ozone layer - Kyoto is both badly constructed and uncertain in its impact. And the countries that matter most have not signed up. How should the thoughtful non-specialist respond to these conflicting perspectives? What we really want to know is whether in 20 or 30 years’ time it will be seen as an important first step towards keeping the world a habitable place, or as a failed experiment, setting the wrong priorities and actually making future international co-operation more difficult to sustain. Perhaps the best way forward is to look at the criticisms of Kyoto and then see whether, despite those criticisms, it is still a useful process. Take first the argument that it is badly constructed and in particular that it excludes the country that is increasing its emissions fastest at the moment and which is now the second largest importer of oil: China. China is already the world’s fifth or sixth-largest economy. The other great global giant, India, is also increasing its energy use. Its economy has been growing at almost as fast a pace, around 7-8 per cent a year. Its energy use at the moment is much lower, for it has not experienced such rapid industrialisation and its building boom has been more muted. But it has become almost as large a car market as China, has the world’s largest road-building programme and the spread of air-conditioning will ensure that its energy use continues to soar. So does the exclusion of these two giants - and much of the rest of the developing world - destroy the rationale of Kyoto? It certainly weakens it. Our perspectives of economic power have changed radically since 1997. Maybe we should have realised that the new industrial countries would determine the world’s energy demands and hence its carbon emissions and sought to bring them into the tent. But the debate within both China and India in some ways supports the Kyoto ideal, even if neither country is bound by it. It is clear that India cannot follow the Chinese growth model, for its population pressure is even greater and its natural resources scarcer. So it has to find a way of growing by using energy more efficiently. In lots of small ways - taxis, for example, run on natural gas - it is seeking to improve its environment standards. So it is very much in the self-interest of both China and India to expand their economies in the “greenest” way possible. But how? Both use technology developed in the rich world. If that technology becomes more efficient, cleaner, and less carbon-intensive, they will apply it. Insofar as the efforts to meet Kyoto standards drive western Europe and Japan to develop better technology, that will inevitably improve the environmental performance of China, India, and other fast-growing developing countries. So Kyoto helps China and India become cleaner, even though they are not bound by it. Beyond economics there is such a thing as politics. Democracies have to work with the grain of public opinion. A Russian president can force through legislation in the way a US one cannot. Criticism of the US has to be tempered with an acknowledgment of the will of its people. Arguably by immediately acknowledging that Kyoto would never be passed by Congress, the present President was at least being more honest than his predecessor, who sidelined political debate on the matter until he was out of office. The two leaders observed at a presentation on energy security action plan, that Pakistan has abundant energy resources which needed to be harnessed through an institutionalised strategy for optimum utilisation. Under the plan, Pakistan aims at meeting its development requirements keeping in view the international trends in the energy sector and availability of resources. QUETTA: The Balochistan Cabinet on Tuesday asked the federal government to declare the province a calamity-hit area in view of the huge losses caused by heavy rain and snowfall. The Cabinet, in its meeting presided over by Chief Minister Jam Mir Mohammad Yousuf, praised the army for carrying out immediate relief operations in the worst-affected areas. It decided to form a committee comprising the Chief Secretary and provincial secretaries to identify the areas needing relief. “Huge losses (to life and property) occurred in Balochistan due to recent heavy rain and snowfall but they ended the eight-year-long drought,” the Cabinet observed. KARACHI: A bloody clash between the Jatoi and Maher tribes again emerged the other day in Shikarpur district, taking five more lives. The feud over land has taken 158 lives of both tribes so far. This dispute exposed the efficacy of the Jirga system as so far five Jirgas had been held to resolve it. The last Jirga was held on February 2 at Circuit House, Sukkur, which resolved the bloody clash through payment. Leaders of Jatoi and Maher tribes had traded allegations against each other, one alleging that the clash re-emerged due to the forthcoming local bodies elections. ISLAMABAD: Minister for States and Frontier Regions Sardar Yar Muhammad Rind has said that under a tripartite agreement between the UNHCR, Afghan refugees and the Pakistan government, three million Afghan refugees would be repatriated by next year. Everybody must work. Otherwise the universal order would collapse. Even Shri Krishna, the self-realised one, worked to set an example to others so that they should not be confused by allusions to detachment and hence stop working. When a young warrior accomplishes what other establishment and renowned warriors could not, much ire is aroused in the latter. Instead of acknowledging the brilliance of the young, they seek to quash him by any means available. Love begins in the family. Peace begins in the family. Where there is love, there is unity, peace and joy.